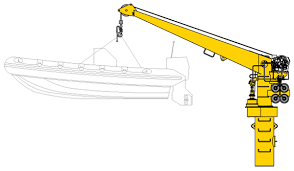 SIMPLETEC 2 T Electro-hydraulic Telescopic Davit is of extremely robust design. The maximum span of the cranes is 7,200 mm and the minimum span is 1,250 mm, with 330º slew. The Davit is free standing mounted on a heavy base plate, which can be bolted or welded to the ship deck. The Davit is mounted on slew bearings, specially selected for heavy duty crane operations. The hoist winch and slewing gear are driven by hydraulic motors through heavy duty geared units. The boom is actuated by a heavy duty hydraulic cylinder. The hydraulic power pack is placed within the crane body. The crane is provided with a remote control pendant. We also offer custom built Davits as per customer’s requirements/specifications.